It has been discussed that lightning flashes emit high-energy electrons, positrons, photons, and neutrons with single energies of several tens of MeV. In the first part of this paper we study the absorption of neutron beams in the atmosphere. We initiate neutron beams of initial energies of 350 keV, 10 MeV, and 20 MeV at source altitudes of 4 km and 16 km upward and downward and see that in all these cases neutrons reach ground altitudes and that the cross-section areas extend to several km2. We estimate that for terrestrial gamma-ray flashes approximately between 10 and 2000 neutrons per ms and m2 are possibly detectable at ground, at 6 km, or at 500 km altitude. In the second part of the paper we discuss a feedback model involving the generation and motion of electrons, positrons, neutrons, protons, and photons close to the vicinity of lightning leaders. 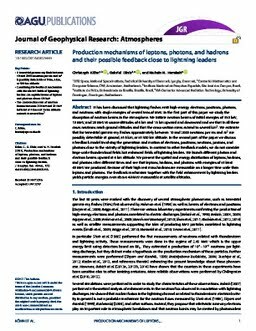 In contrast to other feedback models, we do not consider large-scale thundercloud fields but enhanced fields of lightning leaders. We launch different photon and electron beams upward at 4 km altitude. We present the spatial and energy distribution of leptons, hadrons, and photons after different times and see that leptons, hadrons, and photons with energies of at least 40 MeV are produced. Because of their high rest mass hadrons are measurable on a longer time scale than leptons and photons. The feedback mechanism together with the field enhancement by lightning leaders yields particle energies even above 40 MeV measurable at satellite altitudes.